"I want to challenge you." Which means that spring is here, and the hyacinths are pushing the tips of their pretty green foliage through the garden soil, and the threat of snow is (mostly) over, and the barn is warm enough that I can switch from my fleecy winter breeches to my regular ones when I ride. The end of March also occasions the end of yet another year of Nephew-Birthday-Cake-Making. And I'm not going to lie to you: while I love to make cakes for my little nephews' parties, I love being done with it even more. Because my nephews have taken to "challenging" me (their word) with their cake requests, and birthday-cake-making has come to consume entire weekends. I feel a slight weight off my shoulders now that the birthdays are over: the parties have been celebrated, the cakes have been eaten and enjoyed. Though I know the respite is brief, as Dad guffawed loudly when I stated that my birthday cake days were over for 2009. "A-HEM. My birthday is in May." So I guess I'm not done. At any rate, I thought I would share this year's creations with you all. 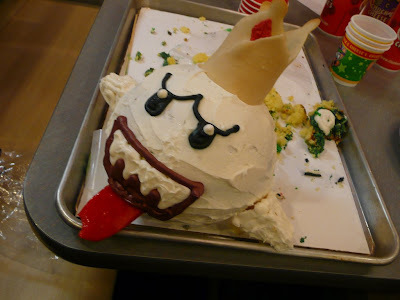 First, Younger Nephew, who turned four in February, requested a cake of King Boo riding the Piranha Prowler. Many of you most likely know (as I did not) that King Boo is a Super Mario Bros. character, and the Piranha Prowler is one of the cars you can choose in Mario Kart Wii. Younger Nephew said, "I want to challenge you, Aunt Di." At first I thought he just wanted King Boo. Easy enough, considering that he's pretty much a white sphere with teeth. But then he clarified that King Boo must be riding the Piranha Prowler, just like he does when Younger Nephew plays Wii. Thankfully, the Piranha Prowler resembles a VW bug, and I have a VW bug-shaped cake pan. So what Younger Nephew deemed extremely "challenging" turned out to be much easier than I expected. The tongue is 10 layers of fruit roll-ups and the crown is a tuile cookie. (Many thanks to the Daring Bakers, whose January challenge was tuiles!) The real trick with the King Boo cake was getting it safely to the Chuck E. Cheese about 15 miles across town. I kept fearing the King Boo part was going to crush the Piranha Prowler part, but: thank goodness for skewers. The cake-maker's best friend. 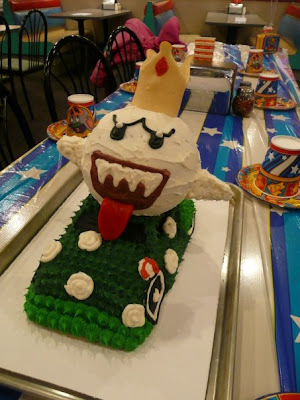 Younger Nephew, for his part, thanked me by biting off the tongue and, after the party was over, licking the icing off King Boo's eyes. I think that means he liked it. Now, Older Nephew, who turned seven about a week ago, originally requested a cake in the shape of Bullet Bill, another Mario Kart entity. 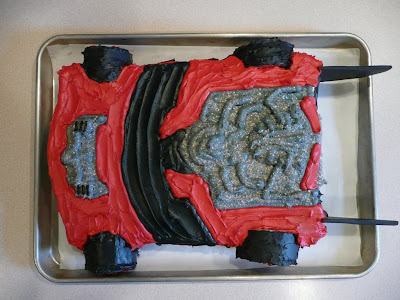 I was agonizing over how to make the arms when...Older Nephew decided he wanted a Hot Wheels cake instead. Bless your heart, Older Nephew. 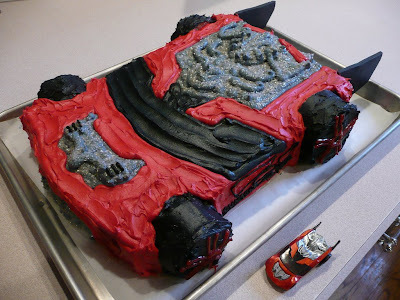 The Hot Wheels cake was pretty simple as well, just a 13" x 9" two-layer cake "carved" to resemble the shape of a car. I baked the wheels in my three- and four-inch cake pans, then cut out an area from the body of the car in which to nestle them. I attempted to make that large silver area (I have no idea what to call it, as it does not correspond to a part of any car I've ever seen) out of fondant, but fondant once again reminded me why I don't really like it. In addition to the fact that I don't think it tastes very good, I have difficulty getting it to stick to itself. And I'm never happy with the way it looks. Too smooth, sculpted and perfect. I think a cake should look like a cake. So I piped the area in gray icing and sprinkled it with Wilton's "cake glitter." (Though I did have to reassure one party-goer's mother that the glitter was indeed edible.) 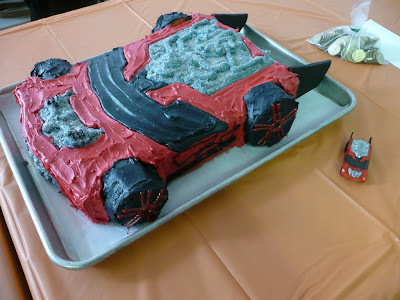 I knew the cake was a success when one of Older Nephew's friends ran over to it and exclaimed, "It's a Hot Wheels cake!" Older Nephew was very excited at his party, which Sister held at a place that has laser-tag and "Euro Bungy," which is just as awesome as it sounds. So Older Nephew was a little too preoccupied to be bowled over by his cake. But in the car on the way home -- in between the constant laser-tag chattering -- he did thank me for his cake, in the sweetest way possible. I know that Nephews will soon be too old to want a cake from their aunt. So I do cherish these days. Even if I am exhausted and totally out of piping bags. My super-fabulous pantry, which was designed and built by my super-fabulous dad, was featured last Saturday on the excellent site, The Perfect Pantry, as part of their weekly peek inside Other People's Pantries. A big thank you to Lydia for sharing my pantry with the pantry-loving public! And please do stop by The Perfect Pantry and have a look around...it will be well worth your time. March appears to be Lasagna Month, at least in my kitchen. I seem to have been carrying a torch for the stuff of late. What can I say? There are few foods as comforting as a dense square of baked lasagna, running with piping hot sauce and rich with salty cheese. The waning winter seems to be a good time to be comforted, and I've told you many times that I am not about moderation. First there was my own lasagna, a dish very much representative of me. Then there was Mrs. DiLorenzo's manicotti: not lasagna per se, but ricotta filling baked in pasta nonetheless. Then came the Swiss chard won tons, which I created to salvage a delicious ricotta filling that was made for a different failed dish. And today it's the Daring Bakers and their March challenge: homemade lasagna. I know, I know. You're thinking, homemade lasagna? Daring BAKERS? Huh? I was a bit puzzled as well, as I certainly was not baking as I made my lasagna last night. But the point of the challenge was the homemade spinach egg lasagna noodles and inasmuch as dough-making can be considered baking, well, there you have it. It was nice to partake in a savory challenge, that's for sure. One that appeases my legendary salt-tooth. The original recipe included a meat ragu, which I as a non-red-meat eater eschewed in favor of my chosen filling: "deconstructed pesto." At the risk of sounding ridiculous, I call it "deconstructed" because fully "constructed" pesto -- pesto that has been whirred with olive oil into a lovely green sauce in the Cuisinart -- really should not be subjected to prolonged high heat, which kills the verdant flavor and mouth-watering brightness. So instead I roughly chopped my pesto ingredients, minus the olive oil and butter, and sandwiched them between the layers of butter-rich bechamel and lovely mottled green spinach noodles. The result was even more delicious than I expected: cheesy, salty and herbaceous, punctuated by the yielding crunch of warmed, toasted walnuts. March, I have never loved you as I love you now. For you used to be all about random late-winter heavy snowstorms and deceivingly sunny-but-cold days. But now you are all about lasagna. This, dear March, is a significant improvement. It is not necessary to have a pasta maker for this recipe, though I won't lie to you: it makes it a whole lot easier and quicker. Of course you could use the Kitchenaid pasta-making attachment, if you have it, but I have an old-fashioned hand-crank pasta maker and I love it. First, make the spinach egg pasta. Mound the flour on your work surface and make a well in the middle. In a small bowl, mix together the eggs and spinach. Pour the egg-spinach mixture into the well and, using a fork, gradually pull flour into the well, mixing it with the spinach and eggs. Keep pulling in flour and mixing until the dough is solid enough to begin working with your hands. Begin to knead the dough together. Depending on the humidity in your kitchen, you will most likely need to add water to bring the dough together, anywhere from 1/4 c. to 1/2 c. Just keep adding the water, little by little, until the dough comes together into a ball. Be patient and don't be discouraged; it will take a few minutes of work to bring the dough together. Once the dough has become a cohesive mass, use a bench scraper to clean any lumps of dough off the work surface -- these will make the dough lumpy. Knead the dough for about 5 minutes, until it is satiny, smooth and elastic. The recipe states that the dough should feel "alive under your hands." I do not know what that means; I do know that you should continue kneading until the dough is a smooth ball. Wrap the dough in plastic wrap and let it rest at room temperature for 30 minutes to 3 hours. While the dough rests, make the bechamel. Place the butter in a medium heavy-bottomed saucepan over medium-low heat. Melt the butter, then sift the flour into the pan. Cook the butter and flour, whisking continuously, for about 4 minutes. Add the milk in a slow stream, whisking to incorporate into the flour and butter. Bring the sauce to a slow simmer and cook for 5-8 minutes, whisking frequently, until the sauce thickens. Season with salt, pepper and nutmeg. Remove from heat and set aside. Next, make the deconstructed pesto filling. This is really a simple herb mixture. Place the basil, flat-leaf parsley, walnuts and garlic into a medium bowl. Mix to combine; set aside. After the spinach egg pasta dough has rested, get busy making lasagna. If you're using a pasta maker, divide the dough into pieces a little larger than a golf ball. Place each piece of dough through the machine several times until it's about 1/8" thick. This took 5 passes through my machine for each dough ball, starting on the widest setting and moving sequentially through the next 4 settings. Each sheet of pasta will be approximately 10" to 13" long. Place the pasta sheets on a counter that's been lightly dusted with flour. Do not overlap the pieces of pasta: they will stick to each other and cause great gnashing of teeth and rending of garments. If you do not have a pasta maker and choose to make the lasagna noodles by hand, follow these directions, which have been lovingly supplied by the Daring Bakers. Please note that I have not tried this method, so I cannot necessarily vouch for it. But if it works for the Daring Bakers....Roll out a quarter of the dough and keep the remaining dough wrapped. Lightly sprinkle a large work surface with flour. The idea is to stretch the dough rather than press down and push it. Shape the dough into a ball and begin rolling out to form a circle, frequently turning the disc of dough a quarter-turn. As the dough becomes thinner, start rolling the disc back on the rolling pin a quarter of the way toward the center and stretching it gently sideways by running the palms of your hands over the rolled-up dough from the center of the rolling pin outward. Unroll, turn the disc a quarter-turn and repeat. Do twice more. Stretch and even out the center of the disc by rolling the dough a quarter of the way back on the rolling pin. Then gently push the rolling pin away from you with one hand while holding the sheet in place on the work surface with the other hand. Repeat three more times, turning the dough a quarter-turn each time. Repeat the two processes as the disc becomes larger and thinner. The goal is a sheet of even thickness, about 1/8". When you have achieved the desired thickness, cut the dough into rectangles about 4" x 8" and let rest on a lightly-floured surface until ready to cook. Preheat the oven to 350 degrees Fahrenheit. Oil the bottom of a 13" x 9" baking dish with about 2 T. of olive oil. Next, cook the pasta. Spread a large counter space with a double thickness of paper towels and place a large bowl of cold water next to the stove. Bring a large pot of salted water to a boil and drop in the sheets of lasagna, about 5 at a time. Cook the pasta for 2-3 minutes (the pasta will continue to cook during baking, so make sure it is barely tender). Lift the pasta from the water with a skimmer or Chinese spider, drain and place into the bowl of cold water to stop the cooking. When cool, lift out of the cold water and allow the pasta to dry on the paper towels. Repeat until all the pasta is cooked. Turn over the sheets of pasta or gently blot them with a paper towel to dry them as much as possible. Finally, assemble the lasagna. Spread a thin layer of bechamel over the bottom of the baking dish. Arrange a layer of pasta over the bechamel, cutting the pieces of pasta if necessary to fit inside the dish. (Remember, though, that this is a layered dish and the pasta doesn't have to fit in perfectly; it will look gorgeous when you cut it regardless.) Spread a thin layer of bechamel, about 3 or 4 spoonfuls, over the pasta followed by a third of the deconstructed pesto filling. Sprinkle with 1/3 c. grated pecorino cheese. Repeat the layers -- pasta, bechamel, pesto filling, pecorino -- until all the ingredients are used. Finish with a layer of pasta topped with bechamel, then sprinkled with pecorino and the crumbled ricotta salata. Place a piece of aluminum foil over the baking dish, taking care to make sure that it doesn't touch the top of the lasagna. Place the lasagna on a baking sheet and bake for 40 minutes. Remove the foil and bake another 10 minutes. Turn off the oven, prop open the oven door (I use the handle of a wooden spoon) and let the lasagna rest for 10 minutes. Cut, and serve. Then cut and serve yourself another piece. Way back at the beginning of the month, when March was coming in like a lion, I attempted to make a dish called "naked ravioli" from a very interesting cookbook, Coast. The book features recipes from chefs in Australia's coastal cities (and if you are mildly obsessed with Australian geography, as I am, you will know that most of Australia's big cities are indeed coastal). I bought the book for Mom when I was in Australia in 2004, and have since "borrowed" it from her. I am such a nice daughter. Anyway. Naked ravioli intrigued me. Cheeky title, delicious Italian-inspired ingredients, from a chef who runs a restaurant in St. Kilda. How could I go wrong? Well. Looks and first impressions can be deceiving. Though the photograph in the cookbook appeared quite perfect and enticing, the dish as I made it amounted to little more than a bowl of shapeless ravioli filling. I hemmed, hawed, then stored the remaining spinach/Swiss chard/ricotta filling in the refrigerator until the next day so that I could sleep on it and come up with a way to make the recipe work. But I couldn't. I just couldn't salvage the dish into something I felt was worthy of sharing with you all. The filling, however, remained completely delicious. It was not the filling's fault that the "naked ravioli" couldn't hold up to moderate heat. It just wasn't fair to take out my frustrations on the filling. And I am so not down with wasting food -- especially yummy food. So into the freezer it went, until I figured out a use worthy of its tastiness. I didn't want to use it as lasagna filling, because March was already scheduled to be quite the lasagna and lasagna-like month. Rather, the answer came to me as I was half-watching an episode of "Good Eats": won ton wraps. Yes, won ton wraps! Such an easy way to highlight the delicious filling without the fuss of making homemade pasta. Not that making homemade pasta is fussy...but it is fussier than opening a package of won ton skins. I put Husband to work filling the won tons with small portions of the gently defrosted spinach/Swiss chard mixture. Always the obedient sous chef, he carefully sealed each won ton, removing as much air as possible before placing them gingerly on a baking sheet to await a quick dip in boiling salted water followed by a good sear in a pan of brown butter and crispy sage. I served them simply, with a scattering of grated pecorino, a crack of black pepper and a few torn sage leaves. Never let a good thing go to waste. Even if it starts out a hopeless mess. Blanch the spinach and Swiss chard in boiling water for 5 minutes. Remove to a wire mesh strainer set in a large bowl of ice water. When cool, drain and squeeze as dry as possible. Finely chop the greens and set aside. Remove any excess water from the ricotta by wrapping it tightly in a clean tea towel and squeezing it. In a large bowl, mix the spinach, Swiss chard, ricotta, egg yolks and pecorino. Season with salt, pepper and nutmeg. Mix thoroughly with a wooden spoon, or with your hands if necessary. Place approximately 1 t. of the filling in a won ton wrap. Moisten two sides of the wrap with water and fold over to seal, pressing out as much air as possible. Continue filling the won ton wraps, placing the finished won tons on a baking sheet. Preheat the oven to 250 degrees Fahrenheit. Bring a large pot of salted water to a boil. Drop about 10 won tons at a time into the boiling water and cook for about 3 minutes. While the won tons are boiling, melt the butter in a large saucepan over medium-low heat, until the butter starts to brown (but not burn!). Add the sage leaves and let them fry gently for about 30 seconds. Using a slotted spoon or strainer, remove the won tons from the boiling water and place them in the skillet with the butter and sage. Cook until slightly browned and crispy, about 3 minutes. Repeat with the rest of the won tons, keeping the finished won tons warm on a baking sheet in the oven. You might need to add a little more butter and sage to the skillet in between batches. Serve with a grating of pecorino cheese, some black pepper and a few fresh sage leaves. Makes about 40 won tons, which serves about 4 people comfortably. The recipe also doubles easily if you're feeling particularly hungry. Seriously, there is no reason not to make your own bread. With just the meager investment of about 30 seconds of whisking, 30 seconds of stirring, five minutes of kneading and about five hours of rising -- during which time you are free to watch television, walk the dog, sleep or try to determine where Daniel Faraday went -- you can have yourself four loaves of amazing French bread. No specialty equipment needed: just a bowl, a wooden spoon, a baking sheet and your hands. There are few foods that offer such a big payoff for such minimal effort. I do not know why I have waited so long to make the following pledge: From now on, I shall make my own bread. All the time. I figure I can carve out the small amount of active baking time each weekend required to make enough bread for me, my bread-loving husband and bread-loving dog to enjoy for the coming week. It's cheaper that store-bought, better than store-bought -- check that, way better than store-bought -- and completely satisfying in that rustic, making-something-out-of-nothing way. No wonder bread has sustained mankind for centuries. You look at the baked, fragrant, perfect loaf and you think: Yeast, water, flour and salt made this?? Extraordinary. This particular recipe is one that Dad used when I was young. As I have mentioned many times in this space, Dad is quite the baker. I have many happy kitchen memories from my childhood, and a lot of them involve Dad and bread dough. I can see why this recipe was one of his favorites: it is extremely simple -- fool-proof, even -- and utterly delicious. It's a great place for me to start on my Bread-Making Quest. It's a great place for you to start, too. Place the water in a large bowl. Sprinkle in the yeast; whisk to dissolve. Add the salt; whisk to dissolve. Add 4 cups of the flour and stir with a wooden spoon to combine. Add more of the flour to make a stiff dough. The dough should be slightly sticky but firm. Turn the dough out onto a floured board and knead for about 5 minutes, until the dough is smooth and elastic. Place the dough in a large bowl with relatively straight sides (as opposed to slanted sides), which enables a higher rise. Cover with a kitchen towel folded in half and place in a warm spot to rise until tripled in bulk, about 2 1/2 hours. Punch the dough down. Cover with the folded kitchen towel and allow it to rise an additional 45 minutes, until it's doubled in bulk. Punch the dough down again. Use a rubber spatula to loosed the dough from the sides of the bowl. Turn out onto a floured board and cut into 4 equal pieces. Roll each piece back and forth with the palms of your hands, sliding hands gradually toward the ends as the dough lengthens. Roll the dough to a length that fits a baking sheet -- in my case, about 17 inches. Sprinkle a baking sheet with cornmeal. Place the four loaves on the baking sheet. Using a sharp knife, make 3 or 4 slashes in each loaf, about 1/2-inch deep. Let the loaves rise, uncovered, for about 2 hours, until the loaves double in bulk. While the dough rises, preheat the oven to 400 degrees Fahrenheit. When you are ready to bake, place a shallow pan of boiling water on the lower rack of the oven (this creates steam while the bread bakes). Brush the loaves with cold water, then bake for 20 minutes. Remove from the oven and brush again with cold water. Rotate the baking sheet and bake for an additional 20 minutes. Transfer loaves to wire racks to cool. Or, you know, eat them right away, while they're still piping hot. Mrs. DiLorenzo was the wife of a bricklayer. She lived on Manor Ave. in New Castle, Pennsylvania, in a pretty brick ranch home two doors down from my parents' first house. I had not yet been born and therefore never met the DiLorenzos or enjoyed the patio built atop the foundation Mr. DiLorenzo put in at my parents' Manor Ave. home. No, I didn't know the DiLorenzos, but I "know" Mrs. DiLorenzo through her manicotti recipe, shared with Mom more than 40 years ago and enjoyed in our household ever since. Not that a single manicotti dish is representative of the sum total of a person, but if all someone ever knows of me is a delicious Italian-American recipe, well, I would be OK with that. Mrs. DiLorenzo's manicotti is simple, but it is tradition at its very best. Mom still uses the same recipe, written in Mrs. DiLorenzo's loopy hand on the back of a paper printed with "Lawrence Savings & Trust Company, New Castle." What makes these manicotti truly special are the homemade "crêpes" that are used to contain the ricotta filling. They are so much lighter and tastier than ready-made pasta. The crêpes must be made in the same six-inch cast iron skillet that Mom has been using for decades, black as night and perfectly seasoned. The batter must be dropped into the pan with the same quarter-cup plastic measure. Mom, Sister and I pass around this cookware like they're the only six-inch cast iron skillet and small plastic coffee scoop ever manufactured in the history of man. Mom made the hand-off this morning: "The pan is in the car. The scoop, too," she whispers, like she's making a clandestine drop of contraband material. "OK," I say. "Did you get the two pounds of ricotta?" In a beautiful moment of serendipity -- right after this morning's manicotti pan exchange -- I happened to be reading the January issue of "Gourmet." I came across a few sentences that speak perfectly to my endearing attraction to Italian-American cooking. In the editor's column, Ruth Reichl writes: "Italian-American cooks seem to understand a human being's basic needs, and their food is instantly seductive. This cooking honors tradition, requires commitment and offers pure comfort with each bite. It is not particularly complicated, but it is so nakedly honest that you can instantly tell when it has been cooked with passion and care and when it has not." I doubt Mrs. DiLorenzo would have articulated it that way. I surmise that she did not over-think her food, she just made meals that made her (and her laborer husband and young neighbors) happy. Her manicotti was cooked with passion, so much so that generations of people not even related to her pass around that old scrap of paper, pan and measuring scoop in hopes of recreating a little bit of what was tasty and comforting about Manor Ave. I wasn't even there, yet I still seek that comfort. Talk about understanding a human being's basic needs. When I posted the recipe for my roasted tomato marinara last September, I shared with you how I make red sauce when tomatoes are in season, fresh, plentiful and delicious. Tomatoes in March (or January, or February, or any number of frigid winter months) are not so fresh, plentiful and delicious, at least in this part of the world. So when the mercury drops, my marinara adapts: instead of roasting fresh tomatoes, I make it with either my own canned tomatoes, grown and put up late last summer, or with tins of high-quality whole tomatoes. 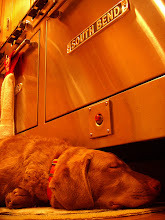 No roasting necessary. I've been meaning to share this adaptation for awhile, and today seems to be the day, as it is a magnificent complement to Mrs. DiLorenzo's manicotti. Heat the olive oil in a large pot over medium heat. Add the onions and garlic and cook for about 5 minutes, stirring occasionally, until the onions begin to soften and brown slightly around the edges. Add the salt and pepper and cook for an additional 5 minutes, stirring occasionally. While the onions are cooking, combine the basil, rosemary, parsley and oregano. If using fresh chop the herbs together. Divide the herb mixture in half. Add the tomatoes, wine and half the herb mixture to the onions. Stir and bring the sauce to a boil, then reduce the heat to low and simmer for about 10 minutes. Using an immersion blender, puree the sauce until it's smooth. (You can also use a regular blender for this step, but the immersion blender is much easier and cleaner.) Stir in the pecorino cheese and simmer for another 10 minutes, stirring occasionally. Add the remaining half of the herbs, and the sauce is ready to use. There are three main components to Mrs. DiLorenzo's manicotti: the crêpe-like manicotti "shells," the filling and the red sauce. First, make the marinara. You can substitute your favorite marinara if you so desire. Then, make the manicotti crêpes. In a medium bowl, beat together the eggs, oil and salt with a hand-held mixer. Combine the water and milk in a liquid measuring cup. Alternate adding the milk mixture and the flour to the eggs, beginning and ending with the milk mixture. Mix until well-combined. Heat a 6-inch skillet over medium heat until it's hot. Using a paper towel, coat the pan with a small amount of vegetable shortening. Using a scant quarter-cup measure, drop the batter into the pan, swirling the pan to coat the bottom with the batter. The pan should be hot enough that the batter sizzles when dropped into the pan. Cook for about 15 seconds, then flip using your fingers and a fork (Mom's method) or rubber scraper (mine). Cook for just a few seconds on the other side, then remove to a cutting board. They should be mostly pale and just barely brown around the edges. Place the finished manicotti crêpes in a single layer on the cutting board until they are cool, then feel free to stack them. Every fourth or fifth crêpe, go ahead and grease the pan with a little more shortening. And don't fret if the first one doesn't work. It rarely does. It takes time to get the pan up to the right temperature. Preheat the oven to 325 degrees Fahrenheit. Make the filling. In a large bowl, combine the ricotta, butter, eggs, pecorino, parsley, salt and nutmeg. (I should state for the record: Mrs. DiLorenzo did not put nutmeg in her manicotti, but instead added a dash of sugar. Mom and I decided to break with Mrs. DiLorenzo's tradition here.) Mix the filling with a wooden spoon until well combined. Place a few ladles of marinara sauce in 2 13" x 9" baking dishes. Assemble the manicotti. Place about 2 T. of filling in each crêpe. Roll up and place on top of the marinara, seam-side down. Repeat until all shells and filling are gone. You might have to use a third, smaller, baking dish depending on how large you make your manicotti. Mom is famous for making them quite full, "like battleships," so we often run over to a third pan. We did tonight. Top the manicotti with a few additional ladles of marinara, spreading it out to cover the manicotti evenly. Sprinkle with a few tablespoons of pecorino, then cover with aluminum foil and bake for 25 minutes. Don't over bake, or the manicotti will dry out. Let rest for about 5 minutes before serving. Please note: the manicotti can be assembled and refrigerated for a day or two before baking. Of the three dishes that we made tonight, we baked two to take to Nephew's 7th birthday party and put the third in the refrigerator to bake and enjoy tomorrow. Makes about 30 manicotti, which will feed 8-10 people depending on the level of ravenousness. I'd always dreamed of a large, well-stocked, stylish, organized pantry. The kind you'd see in a magazine, perfect shelves festooned with meticulous rows of canned San Marzano tomatoes and jewel-green bottles of Pellegrino. On her TV show, when Ina Garten would open up her pantry doors and show off her copious storage space -- enough room to display stacks of concentric oval white porcelain baking dishes; a roomy shelf on which she has placed just three simple pitchers -- I'd get a little wistful and jealous. Imagine having enough room that you don't have to cram all of your cookware and groceries on a few limited shelves, pasta boxes on top of platters wedged next to rolls of paper towels balanced on bags of rice. I realize that my problem stemmed from not only inadequate storage space, but also the possession of WAY TOO MUCH cookware, FAR TOO MANY dishes and a plethora of pantry "staples" that aren't really staples at all, such as multiple varieties of quinoa, several types of couscous and enough chickpeas to feed the Roman army. But the kitchen is my thing. I have a lot of stuff. When I want to make something, chances are I have the necessary ingredients and specialty kitchen tools for the job. Storing it all neatly is the cross I bear. But then along came Dad. Well, actually, Dad was always there. I should say: along came Dad armed with a really good pantry blueprint. One that unapologetically took into account the demanding and fickle pantry whims of his kitchen-obsessed daughter. 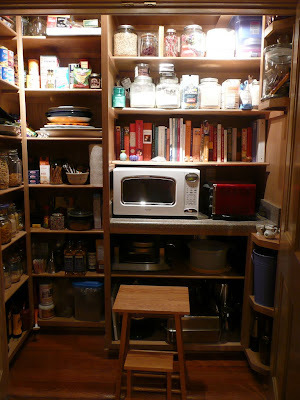 A plan to transform an otherwise wasted space into pantry Valhalla. If it seems like I'm bragging in an unbecoming fashion, it's just because I'm so proud of Dad's skills and grateful to have him in my life. And he says I never appreciate him. Our kitchen has a large closet that used to house the washer and dryer, along with a few sad rows of shelving. It is a good-sized closet; it had to be, to fit a laundry. Since the day we moved in I wanted to convert the space to a roomy pantry. Never mind that the kitchen is spacious already, with plenty of cabinets for dishware and food storage for a normal person. But, I am not a normal person. I needed this extra space! So we moved the washer and dryer to a new laundry room (which Dad also built), and set our sights on the new pantry. I had a few rather specific and needy requirements for the new pantry: I really wanted wood shelving. Dad has considerable skills as a carpenter and I really wanted the space to resemble built-in furniture. I wanted dedicated space for the microwave and toaster oven, to get those appliances off the already-cluttered counter tops. I wanted room to accommodate the kitchen electrics we received as wedding gifts but had not removed from their boxes due to a lack of storage space. These electrics include a waffle maker and a deli slicer along with a fantabulous little press that makes sandwiches in the shape of Snoopy. I needed a place to store my second Kitchenaid mixer. Did I mention I have a lot of stuff? What Dad created is genius. Floor-to-ceiling shelves, each measured and built to house specific items such as my blue plastic bin of cake decorating supplies and the dog's large container of dry food. The unit is divided in two, vertically. On the right side is a counter top that holds the microwave and toaster oven. In front of the shelves on the left side will be a to-be-constructed rolling unit, hinged on one side, that will store oft-used staples like Barilla pasta and jars of tomatoes. The shelves behind the rolling unit hold less-frequently used items like platters and canning supplies. 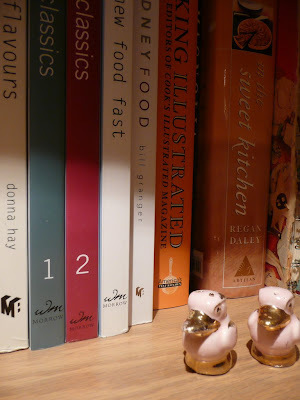 There is a shelf for my very favorite cookbooks, and room for all the Australian candies and biscuits that I hoard like crazy. There is even a tiny shelf just for pepper grinders, and one for ceramic pitchers (Ina, eat your heart out). Sometimes I just swing open the doors and stare at it. It is a marvel. There are countless reasons I am lucky to have my dad; his pantry-building prowess is near the top of that list. Dad, thank you for spoiling me. I want you to know I realize how good I have it. In honor of my pantry, today I present a dish that's heavily reliant on pantry items. I keep many different grains, beans and pastas on hand at all times (along with a wide variety of nuts in the freezer). There is no end to the permutations of side dishes that can be made with such a stocked pantry; this particular combination sounded good to me tonight as an accompaniment to grilled chicken. Preheat the oven to 325 degrees Fahrenheit. Toast the almonds on a baking sheet for 5-7 minutes, until they're slightly browned and fragrant. In a large pot, heat the butter and olive oil over medium heat. Add the onions and cook until softened and slightly golden, about 8-10 minutes. Add the spices (garam masala through salt) to the onion and cook for another 3 minutes. Add the rice(s), quinoa(s), water and chicken stock and raise the heat to high. Bring to a boil then cover, reduce the heat to low and simmer until the grains are tender, 20-25 minutes. Fluff with a fork and remove to a large bowl. Toss with the almonds and feta and serve. I love a good workhorse. Especially a kitchen workhorse. Something that I can use over and over and over again in the service of good cooking or baking. Something that holds up well to years -- even decades -- of heavy use. Something utilitarian that looks good even when it's scratched. Something utilitarian that looks even better for its scratches. I'd give a wheelbarrow full of pristine All-Clad sauciers for one of my grandmother's pots. And I think there are few tangible wares more lovely than a well-seasoned cast iron skillet. Things just taste better in cast iron. Maybe it's the whole sitting-around-the-campfire-and-playing-harmonica-under-a-starry-sky-while-the-horse-is-tied-up-over-there aesthetic. Maybe it's the sound of batter hitting screaming hot iron, dough sizzling wildly in fat. Most likely it's the nearly-smoky charred crust that a nicely seasoned cast iron pan imparts to the foodstuffs cooked within it. As much as I love the cowboy aesthetic -- and I do love the cowboy aesthetic -- I love the crusty goodness even more. Nothing develops a better cast-iron crust than corn bread. Corn bread's rustic, toothsome, delicious texture is an even match for the tasty patina of a cast iron skillet. The batter spatters along the edges when it's poured into the preheated pan. And I can easily see myself making cornbread at a campsite; the tied-up horse would snort deeply through his nostrils to let me know that he wants a piece, too. Corn bread embodies everything I love about cooking in cast iron. It would seem corn bread was made for cast iron. This corn bread recipe comes from Magnolia's Southern Cuisine, the cookbook from the Charleston, South Carolina, restaurant of the same name. At the restaurant (and in the book), chef Donald Barickman serves up southern and low-country standards with delectable flair. Each summer when we visit Charleston, Magnolia's serves as a beacon -- an air-conditioned, delicious beacon -- for our weary, hot, tired selves. 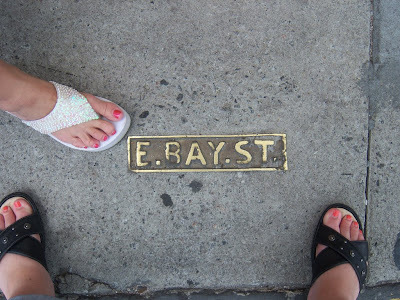 We wander into the restaurant from sweltering E. Bay St., perhaps order a mint julep or a cool beer. We enjoy a rich lunch that is much too heavy for the meteorological conditions beyond the picture windows. We do not care; the food is too good. By the time the check comes I am already anticipating next year's visit. It's a memorable place, made even more special by the fact that it was the site of a perfect dinner Husband and I enjoyed not long after we began dating. You know those kinds of meals: they exist through a Barbara Walters-like soft filter of happy memories and exemplify that hopeful, fluttery feeling of young love. It's no wonder Husband bought me a copy of the Magnolia's cookbook. Charleston nostalgia aside, this is one heck of a piece of corn bread. We ate ours tonight with sauteed chicken, mashed potatoes and gravy. I plan on having a piece for breakfast, warmed and spread with a little bit of soft butter. Maybe even a teaspoon of strawberry jam spooned atop the sturdy crust. Cast iron, I love you. Given how I've gone on and on about it, you might guess that this recipe is best when cooked in a well-seasoned cast iron pan. However, it can be made in a well-oiled 9" x 13" baking pan if you don't have cast iron. But if you don't have a cast iron pan, do yourself a favor and get one. They are inexpensive and will last well into the next millennium. In response to a commenter (hi, Jen! 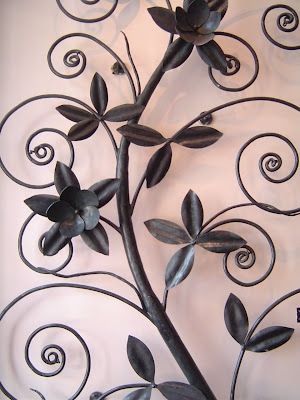 ), I thought it might be helpful to share a little cast iron maintenance advice here: All my cast iron cookware is Lodge -- you can find it almost anywhere, including hardware stores, and it is very inexpensive. My largest skillet was only $29, if I recall correctly. When you first get it home, go ahead and give it a quick wash with hot water and dishwashing liquid, then dry it off and coat the inside of the pan with vegetable oil or shortening. Place it in a 400-degree oven for about 30 minutes. Remove the pan from the oven, let it cool and then wipe out any excess oil with a paper towel. You can go ahead and do this a few more times if you like before using it, or you can start using it right away. A good thing to remember is that cast iron is best used in high heat situations -- on a high flame on the stove or in a very hot oven. In between uses, just wipe it clean with a paper towel and rub it with a little more vegetable oil. For a little extra cleaning, you can also sprinkle the pan with kosher salt and use it as an abrasive. Just dump out the salt and wipe clean with a paper towel and you're done. The more you use it, the more seasoned and wonderful it becomes. Just try to refrain from using lots of soap and water to clean the pan -- it will just rust and ruin the good seasoning you've got going on. I store all my cast iron in the oven, where it's out of the way of my other cookware. It gets a little bit of extra seasoning in there, too, because my oven temp even when it's off is about 100 degrees. Preheat the oven to 425 degrees Fahrenheit. Place the rack in the top third of the oven. If you are using a cast iron skillet, as soon as the oven reaches 425, place the skillet in the oven and let it preheat. This is what makes the wonderful brown crust. In a large bowl, whisk together the cornmeal, flour, baking powder, salt and sugar. Whisk the eggs into the buttermilk, then pour the buttermilk mixture into the dry ingredients. Using a rubber spatula, stir gently to combine. Stir in the melted butter. Bake for 25 minutes or until the top is brown, the center is firm and a knife or skewer inserted into the center comes out clean. Remove the corn bread from the oven and let it sit in the skillet for 8-10 minutes to cool slightly before cutting and serving. Makes 12 nicely-proportioned wedges of corn bread.